You’ve probably heard of a little company called Google. From time to time, they rock the boat by launching a new product that targets a specific market, and that’s what Google Meet – otherwise known as Hangouts Meet – is all about. This latest branch of the Google Hangouts family is set on becoming the default videoconferencing tool for businesses. It represents an improvement over other similar applications, and since it’s a Google product, you know you’re in good hands. In this article, we’ll first explain the evolution of Google Hangouts so far. After that, we’ll discuss how Google Meet came to be, its primary features, and why you should consider using it. We have a lot of ground to cover, so let’s get started! Almost four years after its debut, Google Hangouts looks as slick as ever. Google Hangouts is a communications service that can handle videoconferencing, instant messaging, and Voice Over IP (VOIP) duties. In short, it’s a telecommunication swiss-army knife. The service was launched in 2013, when Google decided to merge several of its existing products into a single platform. These products included Google Talk, Google+ Messenger, and Hangouts (which only handled video at the time). Back then, Google was facing some heavy competition in the field of instant messaging from other giants such as Facebook and WhatsApp. Therefore, it made sense to consolidate its suite of communications products under a single banner, to lure in more users. Almost three years after Hangouts emerged, Google announced two new apps out of the blue: Google Allo and Duo. Both apps encroach on Hangouts’ territory, especially Duo, since it’s all about video calls. This begs the question: What’s going to happen with Hangouts now that there’s a newcomer encroaching on its turf? The answer is that the platform as we know it isn’t going to disappear entirely, but it is going to separate into two branches: Google Meet and Hangouts Chat. The latter is going to focus on instant messaging, with a few new twists (think Slack and you’ll be on the right track). As for videoconferencing, if you’re not a business user, you’ll probably find yourself ‘migrating’ to Google Duo soon. However, if you have access to the G Suite of business apps you’ll have another option: Google Meet. Google Meet, a new alternative for business video conferences. If you’re a bit confused by all the video calling and conferencing apps available from Google, don’t be. Here’s all you need to know: if your business subscribes to the G Suite, you’ll definitely want to check out Google Meet. Just like its parent program, Google Meet enables you to make high-definition video calls through either an app (available both on iOS and on Android) or a website. You’ll be able to schedule meetings ahead of time, join in on calls from your calendar or email account, and talk with up to 30 other users simultaneously. Google Meet also provides you with options to record your calls in case you need to review what was said during your meetings. Finally, G Suites Enterprise users are also able to set up dial-in numbers. These are useful in case one of your members needs to join in on a discussion using their phone. 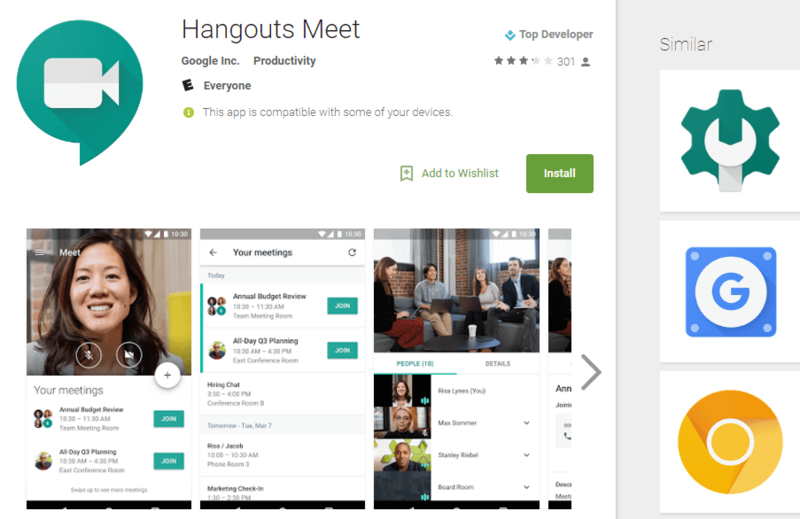 The Hangouts Meet app is already available on the Android Play Store. By now, you should already have a good idea about whether Google Meet is a good fit for your team, based on the features we’ve discussed. Remote teams in particular will find this app especially handy, since it will enable you to schedule and conduct work calls with ease. As long as all your teammates have access to a G Suite calendar – or an Gmail account – they’ll be reminded of future calls and be able to hop in with ease. Google Meet can also come in handy even if your business doesn’t have remote workers. For example, you can use the platform to videoconference with prospective hires in case they can’t reach you in person. If you’re an Enterprise user, you can even use Google Meet to get a dial-in number and have users join in via phone, in case they don’t want to mess around with a website or an app. If you’re a WordPress user, you can also try out Google Meet as a way to stay in touch with your team – or your remote clients – and manage your editorial calendar. After all, even the most organized group needs some facetime now and then if they want to stay productive. Regardless of which type of team you belong to, you can rest easy knowing that Google isn’t likely to discontinue this platform anytime soon. That means your team can settle in for the long haul, and purchasing access to the G Suite comes with enough perks besides Google Meet to warrant its price tag. 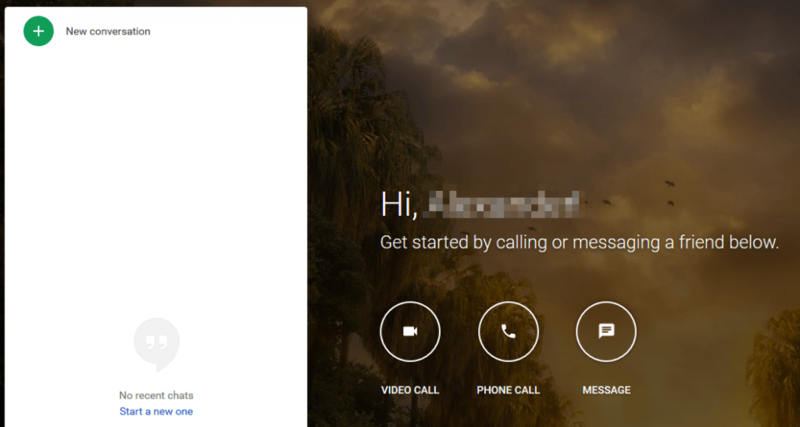 Google Meet may not have launched to much fanfare, but the app shows some promising features. If you’ve already tried out similar videoconferencing solutions, chances are you’ll feel right at home with this one, and you’ll appreciate what it brings to the table. For example, Google Meet enables you to talk with up to 30 participants at once, and it integrates with your email and calendar apps. On the other hand, if you’re part of a team that hasn’t tried out videoconferencing yet, this might be the best time to give it a shot. Videoconferencing isn’t right for every team, but it might just be the tool yours needs to kickstart its productivity. Is there a feature you wish more videoconferencing tools would include? Share your thoughts with us in the comments section below! Thanks for the article. I use youtube for online meetings and broadcasts. This is good news.Thanks for the fast overview before we even got word from Google. Question: Our team has a premium Join.me account and can pass the mouse control to the other screen. Do you know if Google Meet offers the same. It really help with Technical support calls. Hi David, thanks! So far there’s no word on whether mouse control will be a feature, although Google is still in the process of releasing information about the product (so it’s certainly a possibility). Thanks for the comprehensive heads up! I’m a GSuite user and hadn’t even heard about this yet (from Google). Would you recommend Google Meet for my hands on trg sessions with clients? Ie; would I be able to share my desktop during a live session – &/or record it & allow other types of clients to access the recorded Meet on my website or via a link to somewhere within my G-Suite a/c. Because if so, I believe Meet will streamline my biz heaps! can I show/share my computer screen to other participants during the videoconference? Hi Laszlo! You can, although how much you can share depends on the device you’re using. Check out this help article for more info: https://support.google.com/chromedevicesformeetings/answer/3350117. Thanks for this information. I would like to do teaching online and have been looking for a solution that allows me to do break-out groups. So far I only found Adobe but it is very expensive. Break-out groups are essential in teaching psychology, for small group discussions as well as for doing exercises. I understand that google solutions do not have any kind of break out group possibility. Also I would want teach more than 30 people at one time. Any suggestions? You’re welcome, Ben! I’m afraid we don’t have any specific suggestions, but you may want to look into having a custom program designed that will meet your particular needs. Interesting article, made me curious. However, I have tried for 10min to find out how to start a google meet. I googled meet in my g-suit help center etc. nothing found. maybe this is the best hidden service ever. sounds great, but I really do not find it …. Hi! Give this link a try: https://meet.google.com. Wondering if they will allow for screen sharing ? Hi Tim! Check out this article for info on the app’s screen sharing capabilities: https://support.google.com/chromedevicesformeetings/answer/3350117. Is there any way to add a “Google meet” button to a divi-homepage? Thanks Tommy! You’d probably need to do some coding. Try posting in the forums (https://www.elegantthemes.com/forum/) to see if another user has an idea. Google Meet is good. Additionally, you may have a look at tools like on premise R-HUB HD video conferencing servers. It provides 30 way HD video conferencing and works on all platforms viz Windows, MAC, Android, iOS etc.